A possible interpretation of the term בן-שנה could be anywhere in “the first year”–from 8 days to one year, but no older than a year. A second possibility could be an animal that has passed the first year and is in its second year. The wording of some translations makes it sound like it had to be a year old. I always pictured it as more of a new, young lamb, but this might not be the case. If we look at how the bible describes ages we find the following: In Genesis 5 we find that the people mentioned there lived to an age and then had children. Based on how the text is written in Hebrew it is clear that they lived up to that age by passing the birthday. They lived an X number of years (passing the birth date) and then bore children. Hence when someone is one year old they have passed that age. Another factor is the birth cycle sheep and goats have. These animals, in natural circumstances as explained to me by a local farmer here in Israel, have one cycle per year, and give birth at the end of winter to the middle of spring. In many cases it is reversed and can depend on place and species. I have gone out for several years now to observe what I can find and have seen new born sheep that are several weeks old. This to some degree, though not 100% proven, does establish a point of reference that has to be investigated. 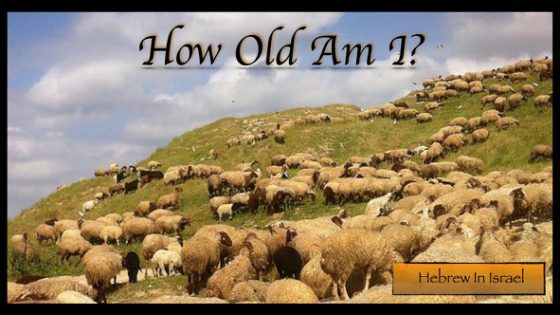 If this is the case it is very difficult to depend on animals which are born in that year (one year being in their first year without passing their birth date making them very young and without meat), and one has to say that the Torah means after the birth date. I will admit that I spoke to a man who was a herder and he did agree with me that animals naturally give birth in spring, but at the farm he worked on they would give birth just before winter. Another possible point is that in Exodus the term is בן-שנה and not בן-שנתו which is much clearer and means “in the first year”. Hence we find that there is a difference in terminology when one is in the first year and when one has passed into the next. Though the evidence is still not conclusive, I think it is better to say that the animals used were born in the previous year making the term “year old” to be after their birth date, and that they have passed into their second year. In other words, the same way we would calculate birthdays today. I do not think that the comparing of the Pesach to the Canaanite spring festival, where they would sacrifice a young NEW lamb in its mother’s milk, should be used as a factor in the answer. The Torah makes sure we keep away from that practice.